The Westmark Skagway is a seasonal hotel that is located in the center of the Klondike Gold Rush National Historic Park in the heart of downtown Skagway. We host over 15,000 guests in our facility during the short summer season (May – September). Our staff enjoys the endless opportunities for recreational activities in this thriving community to include hiking in some of the most spectacular scenery Alaska has to offer. Our support facilities include a 200 seat dining room, a 125 seat Bar & Grill, a small banquet and meeting room, car rental, guest laundry, and more. We employ around 80 people each season. Private housing is virtually non-existent in Skagway during the busy summer season. 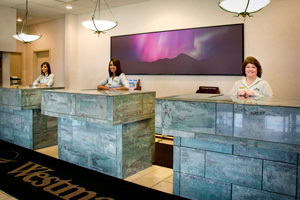 Consequently, Westmark Skagway provides seasonal housing for employees. Each unit accommodates two people and is furnished. We provide pillows, sheets, blankets, and towels. Laundry facilities are available on site. The rent charged for housing is automatically deducted from your paycheck. Cable TV/DVD are available in the communal lounge. Internet access is also available for an extra charge.